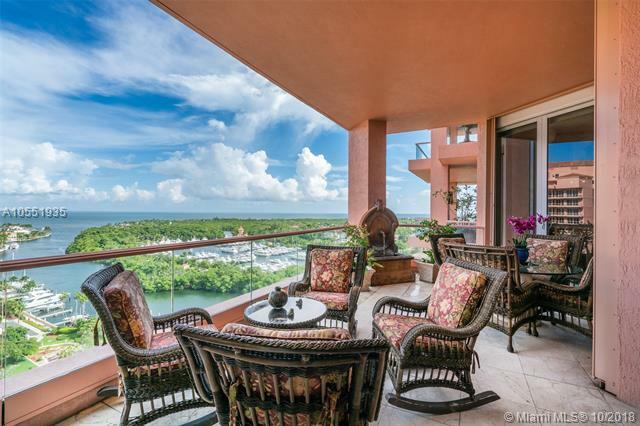 Mediterranean-style 4-level villa overlooking Peacock Park & Biscayne Bay in the exclusive gated enclave Cloisters on the Bay in Center Coconut Grove, just steps from shopping, restaurants, parks & marinas. This home features a private elevator, hurricane-impact windows, travertine flooring & 2-car attached garage. Main Level offers family room, ample storage & covered patio. 2nd Level boasts eat-in kitchen w/professional gas range & walk-in pantry, dining room, powder room, office, great room w/custom bar & terrace. 3rd Level offers 3 bedrooms w/ensuite bathrooms & laundry room. 4th Level offers expansive rooftop terrace w/hot tub & covered dining boasting bay, park & skyline views. Private amenities include club house, tennis court, pool & bay access for watersports. NOT IN FLOOD ZONE.